Sodium Chloride Injection, which is mostly the 0.9% sodium chloride water, also called as normal saline. It is a colorless, clear liquid. And it is sterile and no pyrogenic. 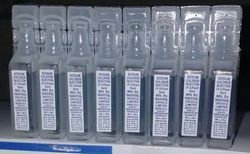 They are parenteral solutions containing various concentrations of sodium chloride in water for injection intended for intravenous administration. Main ingredient of sodium chloride injection is sodium chloride. Sodium chloride is an electrolysis supplement agent. Sodium and chloride are important electrolysis for the human body and mainly exist in extracellular fluid, which play an important role in maintaining normal volume of blood, and extracellular fluid and osmosis pressure. In the last several years, the development of global sodium chloride injection market is stable at an average growth rate of 3.17% (Revenue). In 2015, China is the largest supplier and consumption market of sodium chloride injection with market share of 33.62% due to the largest population. Following China, both Europe and USA occupied market share more than 20%. In recent years, the price of sodium chloride injection is decreasing slowly due to the decrease of raw materials cost. The cost decrease of plastic bottles is much larger than glass bottle. While the flexible bag sodium chloride injection is still much more expensive than the former two. In China, thanks to the policies published, the price of sodium chloride injection and other pharmaceuticals are asked to decrease. In addition, the government also argued the market concentration degree should be higher. In the global market, the market concentration degree is higher and higher. The market share unlisted companies occupied is lower and lower. With the development of technology, the flexible bag sodium chloride injection will be more and more. Over the next five years Sodium Chloride Injection will register a 3.1% CAGR in terms of revenue, reach US$ 2450 million by 2023, from US$ 2030 million in 2017. To study and analyze the global Sodium Chloride Injection consumption (value & volume) by key regions/countries, product type and application, history data from 2013 to 2017, and forecast to 2023. To understand the structure of Sodium Chloride Injection market by identifying its various subsegments. Focuses on the key global Sodium Chloride Injection manufacturers, to define, describe and analyze the sales volume, value, market share, market competition landscape, SWOT analysis and development plans in next few years. To analyze the Sodium Chloride Injection with respect to individual growth trends, future prospects, and their contribution to the total market. To project the consumption of Sodium Chloride Injection submarkets, with respect to key regions (along with their respective key countries). Chapter 7: Europe and More….